We had a very busy month with financially-related decisions to be made! Not all of them were made though – actually, none of them. We just spent a lot of time agonizing. We tried to plan the trip to Chicago that we’re on now and didn’t get very far. We’re probably going to decide on our activities day-by-day, though we have a general idea of what we want to do and what it will cost. We decided to pack all of our breakfasts and lunches and eat out only for dinners – more on that later in the week. Our lone car needed some repairs (see below) but we had to do some research into what exactly we wanted to get replaced and what product to buy. We ended up leaving the purchase for later but have an idea of what we’ll want (hint: the most expensive option). Groceries: For the whole month I thought we were going to be well under our grocery budget, but we had a big shopping trip right at the end of the month to prepare for our trip to Chicago and we barely squeaked under. I made the mistake of going to Costco and got larger volumes of many items that we don’t normally buy but wanted for this trip, so we’ll have to eat those down when we return. Hopefully that will mean next month’s spending will be lower from being out of town and having a lot of leftover food. I only went to the farmer’s market twice, which was less than I wanted, but we got adequate vegetables from our CSA so it turned out fine. Gas: We filled up four times this month (not including our vacation travel) so we went way over our gas budget! We drove out to an outlet mall to buy Kyle’s tuxedo so that definitely contributed to our higher-than-normal usage. Can’t go without gas, though, with only the one car, so this was unavoidable. Restaurants: We kept under budget here with only going out three times aside from our vacation spending. Once we both ate dinner, once only Kyle ate, and once we both had appetizers during a trivia contest. Every month we also have some random other transactions that aren’t covered in the budget but aren’t supposed to be taken out of a targeted savings account. We used gift cards for our Target purchases this month. Since I still counted the purchases as expenses in our groceries and other categories, I will counter it by reporting the amount that we spent off the gift cards as income: $33.07. We received a large anniversary gift (see below). We finally got our state tax refund (see below)! As a surprise present (rare for us!) Kyle bought me a can of tennis balls for $4! I’m always clamoring for new balls but Kyle is content to use the decent but many-years-old ones we have so using the new ones was a treat. We ran out of money in our Appearance budget, so we covered two expenses with cash flow that should have come out of that account. 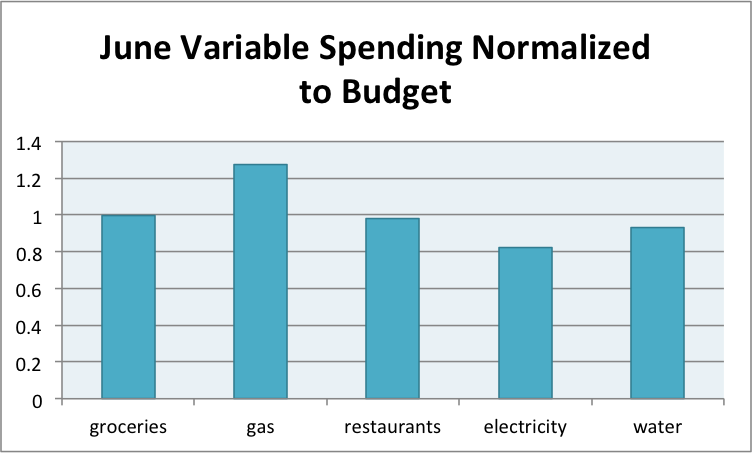 Believe it or not, we did adjust our spending because we knew we were out of money in that category. I got an $18 haircut (instead of a $50 one) because it was sorely needed and we had events coming up that I wanted to look nice for. Next time I need a haircut (I get about two per year) I’m going to give Kyle a shot at it. I get very simple haircuts and I don’t care a whole lot so we’ll see how it goes. In total, we spent $853.00 out of our targeted savings accounts this month. We went on a retreat with our graduate Christian fellowship group at the beginning of the month and spent $66.59 all told on meals and gas. We also spent $124.91 on two registry gifts for events. Our travel expenses for our Chicago trip (June 29 – July 4) will be in our July review. This month we paid our yearly renter’s insurance of $134. We took our car in to get checked out in advance of driving to Chicago and ended up doing $417.25 in repairs. We were also told we need new tires but a second opinion disagreed somewhat. We might replace the tires soon, or as soon as we can save up our $500 buffer again. I want to drive another 15,000 miles on these tires, which is what the tire people told us they had left in them, but Kyle wants to replace them sooner (just not in time for our Chicago trip). Apparently the last time he bought new tires (2) they put racing tires on, which are obviously inappropriate for our car, so we were told that we’re experiencing a “rougher” ride than we would be with proper tires. All that is to say that we spent some money out of this account, which thankfully we had without having to dip into the money we’re saving for other purposes, and we might have more repairs coming up, which means we’ll have to increase our savings rate to this account. Kyle went to a birthday celebration at a local arcade/amusement park and spent $15.25. I’ve decided to stop using this account for CSA overages and local food, at least for the summer. Those expenses are going under our grocery monthly budget. We ended up using part of June’s balance in this account to cover $53.49 in leftover shoe expenses from May. Because of our resulting low balance, we covered out of our cash flow for the two purchases I mentioned above. So we might take that money out of July’s appearance balance to refund that or just give up and fund this more aggressively. Kyle bought a new keyboard for his desktop for $7.48. No spending this month, but we did make two Kiva loans with money that had been repaid from our last loans. This account received an infusion of May’s budget leftovers of $185.13, but then $151.10 went right back out to pay for Kyle’s tuxedo and alterations. No way our Appearance savings account could cover that expense! I also ended up putting our anniversary gift and tax return into this account, so until we decide to spend part of that money on something fund, we are actually no longer in debt to ourselves! No budget adjustments this month, but Kyle and I are looking forward to our new lower rent so we can tweak some categories! Coming in August or September! In all, we came out $91.21 ahead this month, even after removing last month’s huge leftovers. I’m surprised and excited to have so many months in a row in the black! How was June on your budget? Are you seeing travel/eating out/entertainment expenses spike with the start of summer? How about tuning up vehicles for summer road trips? 6 Responses to "June 2012 Month in Review: Money"
Well I’m glad rent will be cheaper for you! That’s always a plus. You would have thought your current place would like to keep someone around who pays their rent and is a good renter rather than trying to find someone to replace you and have to take that gamble all over again. There are so many students around here that the turnover is huge so they are apparently confident they’ll find other people. Grad student income is also REALLY reliable and the jobs are secure. Haha Kyle just doesn’t take as much joy in new balls as you and I do… or get as annoyed by old ones. I hope so. I’m ready for some budget upheaval.